The traineeships are by far the golden way to commodity trading. Most of them will offer a rotation in different departments giving you a broad view of the different jobs involved in a transaction. It depends on the companies, but some offer months in offices abroad to learn about the origination. I’ve also heard that a well-known bunkering firm offers to their trainees the opportunity to live on board of one of their vessels for a month. Imagine the kind of knowledge you could get from those experiences! I know 3 guys who’ve got in with a traineeship program. The 1st got a job at Trafigura. As of today, he runs the non-ferrous desk there. Pretty cool :-). The other one started at Louis-Dreyfus Commodities and after 5 years there, he moved to a hedge fund. Finally, the last one followed a traineeship in a midsize trading company that went bankrupt :-o, but he managed to find (before the bankruptcy) a job at the Swiss National Bank! BUT, as I wrote above, only 3 guys got in with a traineeship on the hundreds of professionals that I know. Keep that in mind! 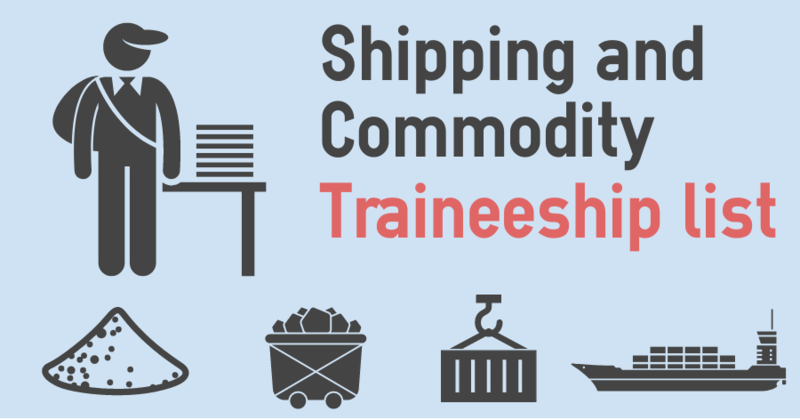 In the list below, you will find a list of companies with specific shipping and commodity traineeship programs. Of course, the ones in trading companies are the most valuable… but the hardest to reach! If you want to add a company to the list, don’t hesitate to comment or shoot me an email ! I believe you could add Bunge, Gunvor, Noble, and Mercuria to the list of trading companies. Great blog content, I look forward to reading more articles. Tanks man ! Are you sure Gunvor and Mercuria offer traineeship ?? ?